Towards the end of 2012 Thai Airways took delivery of their first Airbus A380. The first couple of aircraft were used initially on short haul flights to Singapore and Hong Kong before starting long haul operations to Frankfurt. Although the whalejet no longer flies to Singapore it does operate one daily return trip to Hong Kong. At about 2.5 hours this is the shortest route on the Thai network that offers a first class cabin (the 747-400 operates the 2nd daily first class service to HKG). Finding myself in Hong Kong this last January I decided it was the perfect opportunity to give the Thai A380 a go. I was most interested in first class so booked a first class ticket from Hong Kong to Sydney via Bangkok. The first leg being on the 380 with the second being on a standard B747-400. I was taking the airport express train to the airport so I completed check-in at the Kowloon train station where my bags were tagged with first class tags through to Sydney. Free from my bags I took the next train to HKIA. Passport control and security formalities were quickly completed and I made my way to the Thai lounge. The lounge features a separate first class zone where there are a few dishes available to order as well as a buffet section for drinks and various food items. The lounge is elevated above the departures zone and has nice views of the surrounding tarmac and runways. Overall its adequate but nothing special, do not plan to arrive early just for the lounge. Eventually the flight was called and i made my way onboard through the upper deck aerobridge (first class is on the forward upper deck with business behind, economy is on the lower deck). Today's flight was operated by HS-TUC, the third and newest A380 at the time. It was delivered just 5 weeks beforehand. As you can see Thai have opted for an open feel with this cabin rather than the enclosed suites concept. I like it, it feels very spacious and the colour scheme is calm and soothing. There are overhead lockers in the centre section only which adds to the spacious feel, there is plenty of space at each seat to put a standard rollaboard suitcase under the ottoman area. If you have a window seat there is also storage space along the wall between the seat and window which you can see in the photos. The seats extend into fully flat beds without having to standup first (unlike the singapore airlines suites). There are large lcds in each seat for the on demand entertainment system which is controlled by a small handset conveniently located just beside the seat. The Inseat power supply is also found there. If you are wondering what the rectangular panel beside the seat does, well it is actually a sort of ambient light source you can use during overnight flights when the cabin is in darkness. With champagne in hand and boarding still in progress there was time to explore. 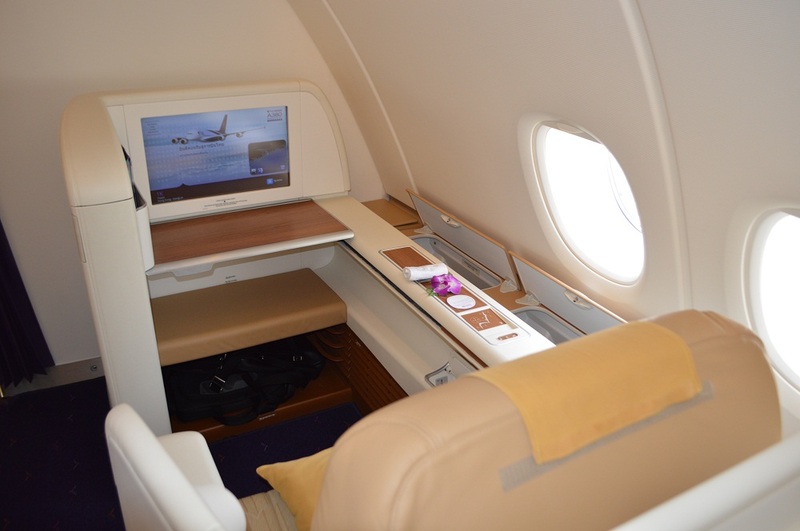 The Thai A380 has a small lounge section for first class passengers to use in the forward right hand side. The area can seat 4 people comfortably although I have heard it is rarely used. The forward lavatory is huge and features a dressing room with mirror and place to sit. Handy for both changing into pyjamas and for the ladies to do their makeup. For flight TG601 an ample lunch is available consisting of canapes, starter, main, cheese and fruit then dessert with tea and coffee. Perfectly extravagant for a flight of this length. Eventually the rest of the passengers arrived and the 12 seat cabin filled to it's capacity. A Johnny Walker Blue label and coke! The picture above is the lobster thermidor which can be ordered as part of Thai's own 'book the cook' service for First Class passengers. The ordering can be done on the Thai website in advance. Lobster was not on the standard menu for this flight. Overall food quality was decent but not outstanding. It's certainly plentiful though and I did not go hungry. I don't need excellent food to enjoy my Dom Perignon anyway which is the best part of flying in First! By the time lunch was over we were 2/3 of the way to Bangkok so i just settled back with some more champagne and watched TV. Eventually the flight had to come to an end and we commenced descent into Bangkok. At this point one of the lovely crew members came by to thank me very much for choosing to fly with Thai and noting my love of the champagne they presented me with a bottle of Dom to take home. This was MOST appreciated and left me feeling very happy indeed! I've flown First on many carriers and Thai's offering is definitely not the best but it is still of a very good standard in my opinion. I really enjoyed the A380 seat and cabin look and feel. It was very comfortable and I don't mind the lack of total privacy that an enclosed suite would have offered. I would really like to give it a go on a long haul flight in the near future. The service on Thai can be hit and miss but on this flight on this day it was nothing short of excellent. The crew handled the full cabin brilliantly and I felt extremely well looked after. I think the fact that it was a beautiful new aircraft really made the crew proud and excited to be working on board. On disembarkation I was greeted by ground crew members with a signboard with my name on it and whisked away by buggy straight to the First Class lounge for the transit. Just a few minutes later I was in the shower in the spa getting ready for my full body oil massage, the ground service in Bangkok being amazing when traveling on Thai First. Coming up next is a review of the onward flight Bangkok to Sydney on the 747.
Who were you traveling with?? This is a big improvement, the foods look so yummy. Did you just put coke into your johnny walker blue??? It was a good flight but not the best. Thanks for the review you have given. are you taken to the first class lounge upon arrival? or is it just for connecting flights. you are escorted to immigration and fast tracked, then helped to your ground transportation. You do not get first lounge access unless connecting to another international flight.